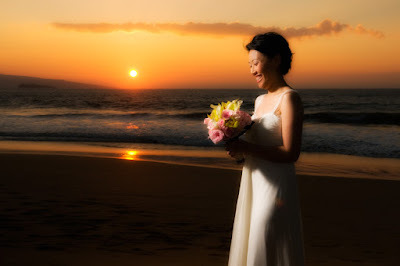 Many brides will ask us when is the best time to schedule their Maui wedding. This is a very important question. Couples from the mainland are sometimes surprised to hear that temperatures on Maui in the middle of the day can reach 85 degrees, even in February. Not the best time to do an outdoor ceremony. We generally try to wait to do the ceremony an hour to an hour and a half before sunset, depending on the size of the party. By this time, the beaches are beginning to thin out and the temperature is starting to cool. Since most ceremonies take about 15 minutes, this timing leaves us plenty of time for those killer Maui wedding images our clients are after. Toward sunset, the light begins to soften and the temperature cools. The soft evening breeze calms down and sunset settles in. Sunset happens fast here. The term "golden hour" was obviously coined on the mainland. on Maui it's more like the "golden half hour", which is why it's so important to hire a seasoned professional photography team, like Joe D'Alessandro Photography, to capture this unique once in a lifetime moment.